Nowadays, many aspects of electrical and electronic engineering are essentially applications of DSP. This is due to the focus on processing information in the form of digital signals, using certain DSP hardware designed to execute software. Fundamental topics in digital signal processing are introduced with theory, analytical tables, and applications with simulation tools. 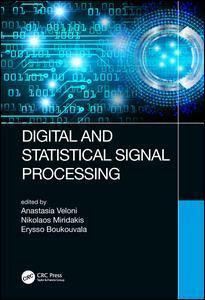 The book provides a collection of solved problems on digital signal processing and statistical signal processing. The solutions are based directly on the math-formulas given in extensive tables throughout the book, so the reader can solve practical problems on signal processing quickly and efficiently. Explains how applications of DSP can be implemented in certain programming environments designed for real time systems, ex. biomedical signal analysis and medical image processing. Pairs theory with basic concepts and supporting analytical tables. Includes an extensive collection of solved problems throughout the text. Fosters the ability to solve practical problems on signal processing without focusing on extended theory. Covers the modeling process and addresses broader fundamental issues. Part 1: Digital Signal Processing. Introduction. Discrete-time Signals and Systems. z-Transform. Implementation of Discrete Systems. Frequency Domain Analysis. Designing Digital Filters. Part 2: Statistical Signal Processing. Statistical Models. Fundamental Principles of Parametric Estimation. Linear Evaluation. Fundamentals of Signal Detection.